Sometimes it get a bit hard to be positive and enthusiastic if you are trying to influence change, especially change for the ‘little people’ in the face of giants. I’ve heard and shared in conversations to this effect lately, many peppered with expletives, and found myself getting weighed down and overloaded. We have all been asking similar questions. How do we keep going? Where do we find sources to renew our energy? Is it hopeless? These feelings were exacerbated, when we were confronted with both ugly overt racism and arrogant political corruption at the same time. I was angry but this time it was an energy for action that could not be denied. I had to do something. I cast around still just sharing the ideas and observations, still wondering if sharing on Facebook and Twitter was enough. We all talked and shared some more. Then things changed. It was as if there was a tipping point at which enough people were angry and frustrated, for the energy to turn into positive communal actions. Instead of fuming separately, the actions manifested in many ways at once, reminding us that there is power for change in sharing amongst the ordinary people. The many little actions erupted across the state and then the country. 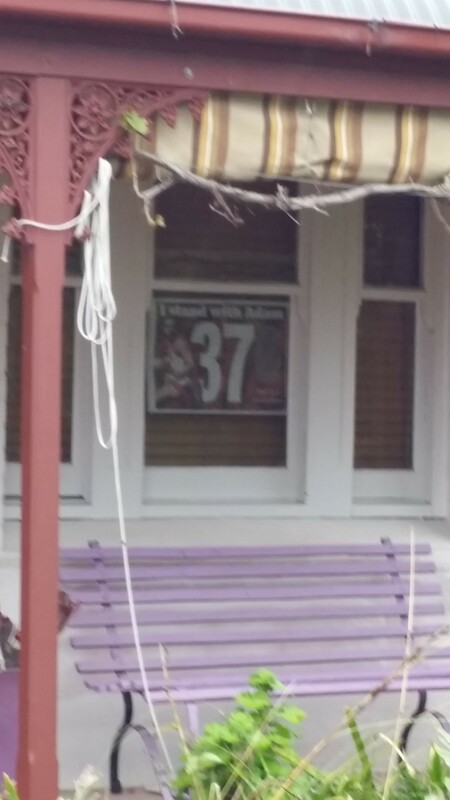 There were #statements, posters to put in the window, a whole football crowd dressed in red shirts with the number 37 on them, the NRL players decided to do a dance when they scored. Little children at the Garma festival in the NT painted number 37 on themselves when they were dancing. The energy of the actions was contagious. They were not grand undertakings, but what they released grew. People spoke out publicly and strongly about the racism in this country that is unspoken and denied. They named it, and showed that in spite of all the despair, this time there were many more who understood what it meant at both a personal and structural level. It was targetted at one man and shown as support for that man, but there was no misapprehension that it was simply a personal thing. Yes, it is a pity it didn’t happen earlier. Yes, our Prime Minister was missing in action. Sure, there is still ignorance and arrogance aplenty being given airspace. But it did happen and I believe we are one step further forward because of it. I have to hang on to that. By the way, it was a younger Aboriginal player who led the action to support Adam Goodes and to show that waiting for such abusive behaviour to go away was not an option. His name is Lewis Jetta. It was a sweet moment when he kicked the first goal of the match this weekend and even sweeter that he did a celebratory dance… Watch this man. He is a leader. 1 Response to Ordinary Power.